30% discount on calls to the Dominican Republic on February 27, 2018, for Dominicans abroad. Dominicans can save on their international calls with the offer and the Facebook contest powered by LlamaRepublicaDominicana.com. LlamaRepublicaDominicana.com, the service dedicated to the Dominican community worldwide, supports calls to the Dominican Republic on Independence Day with a 30% OFF. The discount applies to both calls to landlines and mobile phones in the Dominican Republic on February 27, 2018. 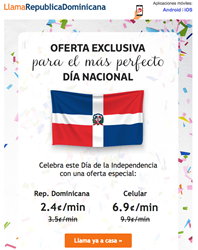 To benefit of the Independence Day 30% discount, one needs to have a free account on LlamaRepublicaDominicana.com and a PIN, in order to be able to make the calls using the KeepCalling app or an access number (no Internet needed). A PIN will be received immediately after placing the first order on the website. The minimum order value to get a PIN is $2 Voice Credit. The Voice Credit balance, be it as little as $2, never expires, so it can be used any time necessary. All Facebook comments to the question "What makes you feel proud of your country?" enter the race for credit. The winner will be picked randomly and announced on Tuesday, March 6, 2018. The discounted rates on February 27, 2018 are 2.4 cents/minute to call landlines in the Dominican Republic, and 6.9 cents/minute to call friends and family on their cell phones. The regular rates to call the Dominican Republic are the lowest on the global market. It's 3.5 cents/minute to call landlines in the country, and 9.9 cents/minute for international calls to cellular phones. Every time these rates drop, subscribes are informed by email. There are at least 3 advantages that existing customers favor about this service, as shown on Trustpilot, a popular review platform. There are 4 calling features that anyone using the service can activate for free; PINless and Speed Dial for example. Anyone buying Voice Credit balance for international calls on LlamaRepublicaDominicana.com, automatically receives Thank You points, that is loyalty points that anyone can turn independently turn into free Voice Credit balance for future calls. Calls can be placed using WiFi or cellular data via KeepCalling app, or using an access number that requires no Internet connection. More information about how to call can be found on the website. Besides the Voice Credit, LlamaRepublicaDominicana.com also facilitates mobile top ups for family members and friends in the Dominican Republic. The process takes few seconds only. More details are available on the website. LlamaRepublicaDominicana.com is a platform created for the Dominican diaspora, that offers calling credit for Dominicans abroad and facilitates top ups to mobiles in the Dominican Republic. It is a brand of KeepCalling, which is a global telecommunications company registered in 2002 in the USA, listed by Inc 5000 as one of the fastest growing companies in the USA for 5 consecutive years. Presently, KeepCalling provides its services to hundreds of thousands of consumers , with a focus on customer satisfaction. In 2015 the company registered a revenue increase of over 200% from 2011 to 2014.